Based on Marc Brown's popular children's books, PBS Kids educational television series ARTHUR follows the animated adventures of the loveable aardvark as he works through problems and learns valuable life lessons. 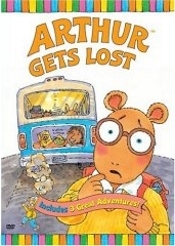 This volume features three fun-filled episodes: in "Arthur Gets Lost," the aardvark takes the bus to a part of town he's never been to before; in "Arthur Cleans Up," the gang set out to clean a garbage-strewn park; and in "D.W. Gets Lost," Arthur's spunky little sister tears up a department store. Arthur is all set for his first solo ride on a public bus. He's got the exact fare and a book to read, but one thing he didn't count on is falling asleep! When he wakes up, Arthur finds himself in a strange and scary part of town. Will he ever find his way home? And will D.W. ever forgive him for scaring her like that? Arthur Cleans Up: Elwood City's park is in bad shape. There is garbage everywhere. After grumbling about it, the kids find themselves "volunteering" to clean it up. Even though it is a lot of work, in the end they all decide it feels great to make a difference.